Today, I met Cass, an energetic and friendly 2 year-old Chow-Chow mix who loves to play fetch. I spent about 20 minutes with Cass in the courtyard. She's affectionate and is learning how to sit on command using treats. 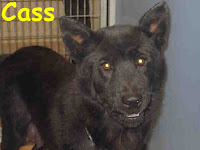 Cass would make a wonderful pet for any loving home. 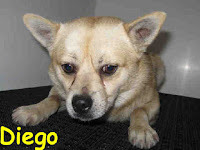 Diego is a sweet 1 year old little Pomeranian/Pug mix. He loves to go on walks and is very well behaved - easy on the leash and walks right beside his dog-walker. Diego would make a great pet. Yesterday I (Simon and Cool's mom) volunteered at the local San Diego county animal shelter. I've been volunteering since January, about twice a month, walking, interacting and caring for dogs. There are so many animals that need homes. With the economy the way it is, and number of foreclosures, pet owners have unfortunately been left to give up their beloved pets. This is a tell-tale sign by the number of animals in the shelters. As a way to help promote these animals find their second chance/forever homes, I've decided to Blog about my experiences with the dogs I meet. Pattycake is a sweet black and tan Miniature Pinscher/Chihuahua mix. She is very affection and well mannered 6 year old pup. When we went for a walk, she was very easy on the leash, was very energetic and liked to sit in my lap when we took breaks. 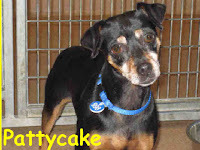 Pattycake would make a wonderful pet for any family. Duke is an energetic Labrador Retriever/Sharpei mix. He is 4 years old and loves to play fetch. We played tug in the courtyard which he also loves. He is a strong dog who does not tire easily (unlike me). 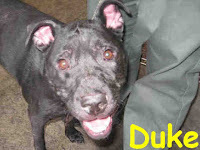 Luckily, I kept up with Duke and when he finally took a break, I tried teaching him how to sit using treats. He got the hang of it after a few tries.